For whatever few climate change deniers still exist, James Balog has something he'd like to show you. Not content to just rely on scientific data and the past decade's parade of weather-related disasters to make his point, Balog — an internationally revered nature photographer — set out over a number of years to record the erosion of some of the world's greatest glaciers, hastened by mankind-created global warming, with time-lapse photography. "Chasing Ice" follows Balog as he sets up numerous cameras in remote areas of Iceland, Greenland and Alaska to accomplish this. Understand, we're talking no small endeavor here — these cameras have to function in some of the harshest weather conditions imaginable, withstanding intense cold, heavy winds and snow. Balog begins his project — dubbed the Extreme Ice Survey — in 2005 and runs into problems both technical (camera malfunction) and personal (Balog basically blows out his knees trudging over and climbing up icescapes) as the film plays out. But the effort proves well worth the trouble and pain. With multiple cameras shooting on the hour, Balog is able to track the alarming — and it truly is alarming — rate the glaciers are melting, feeding ice into the sea and consequently raising the oceans' water levels. Balog's footage shows one glacier losing the same amount of ice in this century's first decade as it lost in the previous 100 years. It's both horrifying and magnificent. Director Jeff Orlowski has a tough task himself — he's essentially taking pictures of a guy taking pictures. But the awe-inspiring glaciers — and the crazy-dangerous risks Balog takes — keep the film vital, while the sheer size of the natural beauty and the natural disaster is jaw-dropping. 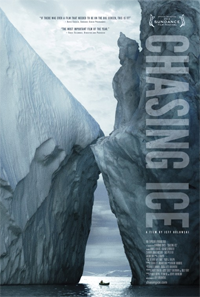 Quite simply, the footage Balog captures makes "Chasing Ice" the most important documentary of the year. That Orlowski is able to give it a human context only enriches the film all the more. This is one magnificent, horrifying film.